As of March 27, 2015, Maryann Argyres is listed as the Secretary on the Farm Bureau website. Maryann is also the Principal Officer of the campaign committee called El Dorado County Voters for Local Control (EDCVLC). 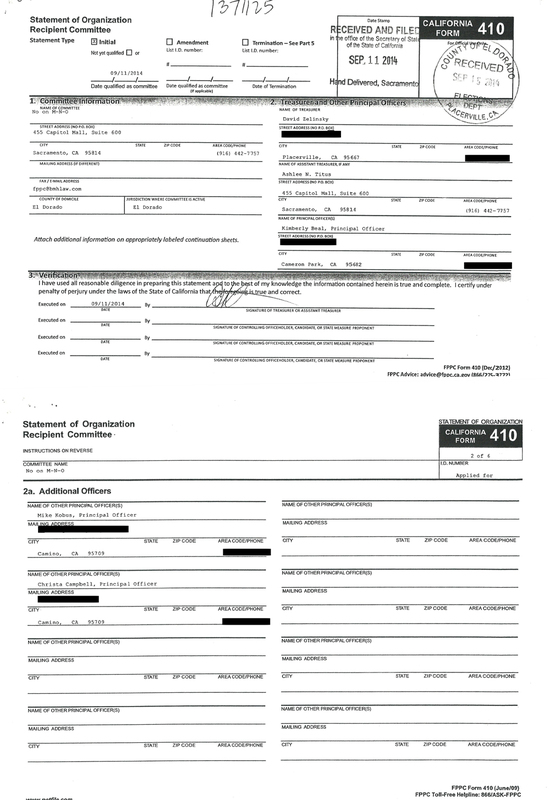 See their form 410 below. EDCVLC is the group that put newspaper ads in the Mountain Democrat in early 2014. Those ads advised people not to sign the petitions that were being circulated by grassroots groups to stop rampant development in El Dorado County. EDCVLC received funding from Parker Development, who is affiliated with Serrano LLC and Marble Valley LLC. 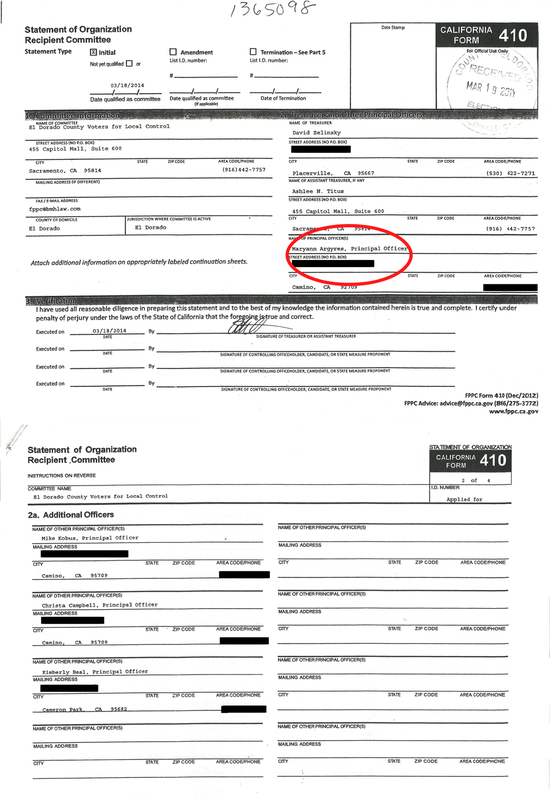 See form 465 below. Parker Development has an approved project for 398 residential units called Marble Valley. Parker Development currently has plans to super-size Marble Valley to a 3,126-unit residential project. Here is that website: www.thevillageofmarblevalley.com Another project proposed by Parker Development is Central El Dorado Hills, which is a high-density residential project proposed for the old golf course along Highway 50 in El Dorado Hills. Both of these projects are planned for several times more units than what is allowed by the zoning and land use densities. The projects will require rezoning of the parcels and amendments to the County’s General Plan. Questions have been raised as to why Maryann, who represents local agriculture on several committees, has aligned herself with a developer who wants to build thousands of residential units more than what is expected in El Dorado Hills. This is especially concerning when we are in a drought and more houses will put a strain on our already overburdened water supply. It has been said that residential water use trumps agricultural water use, so it is unclear why an Agricultural representative like Maryann would align with a developer that wants to build more houses than planned for in the El Dorado County General Plan. After the EDCVLC campaign committee served its purpose, it morphed into the No on M-N-O campaign committee. The only difference between the EDCVLC and No on M-N-O committee is that Maryann is not listed as an officer on the No on M-N-O committee. 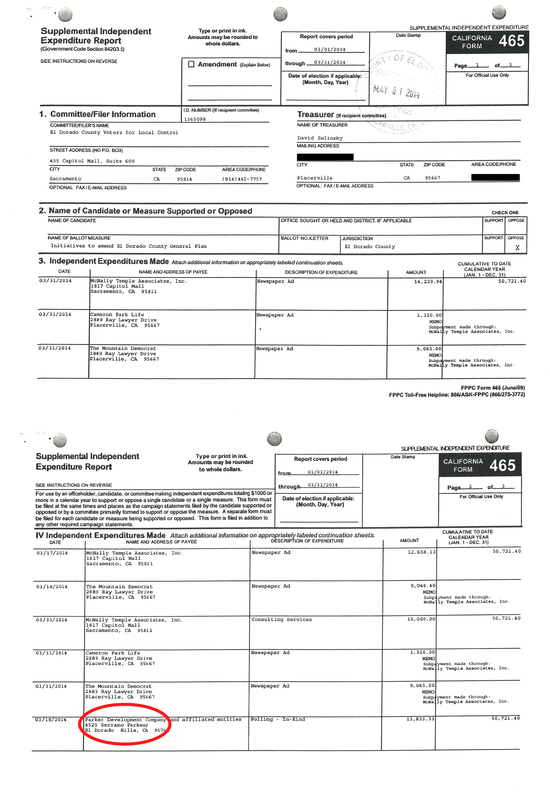 See form 410 below. 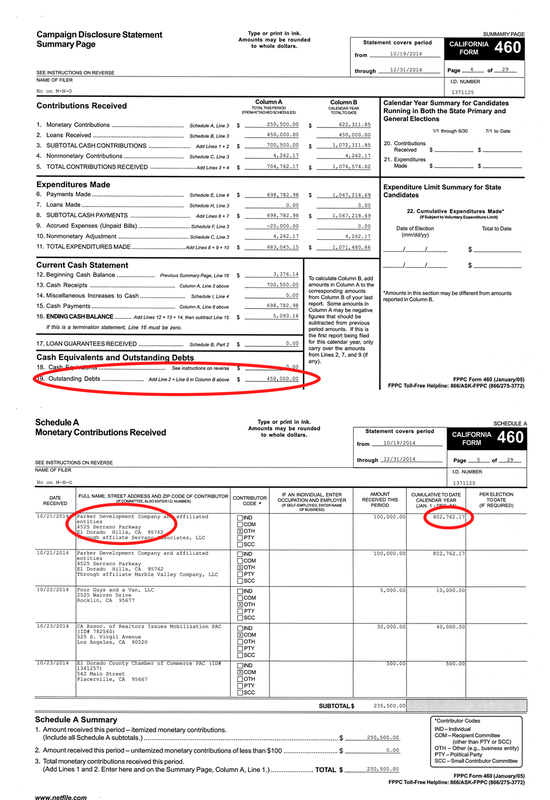 As of 12/31/14, Parker Development poured $802,762.17 into the No on M-N-O committee. That is an unprecedented amount of money spent on an El Dorado County political campaign. And, as the form 460 shows below, the committee has outstanding debt that will be paid off in the future. Again, the alignment of an Agricultural representative and one of the largest developers in El Dorado County is puzzling.